Apple may well have the claim of being the largest company in history (so far) but when it comes to mapping, their Apple Maps product is still seen as second best to that of Google. Over the past few months however Apple have been taking steps to shift that perception. Apple currently has just over 32% 45% of the UK smartphone market (updated 27th Jan 2016) and more than 50% of the tablet market. On each of those Apple devices Apple Maps is the standard installed app for maps. Even though folks may well add Google Maps it’s clear that Apple’s own maps app is seeing increased usage. 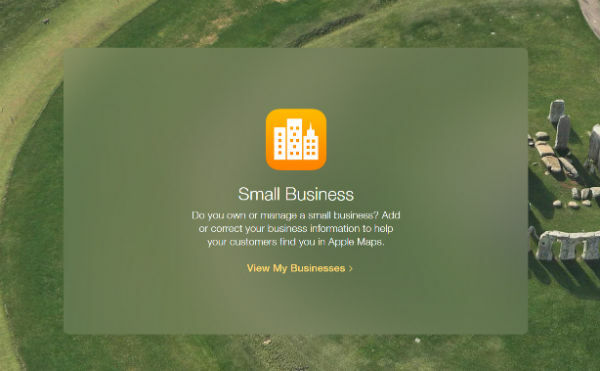 Just like local business owners should claim their listing on Google My Business the same is also true for Apple Maps. Data for Apple Maps is likely coming from a few different sources and here in the UK the primary one is Yelp. Other providers are Factual and TomTom, with Axciom and OpenStreetMaps also believed to be potential sources. Taking control of your listing on Apple Maps will help but it’s also highly recommended that you check out those additional sites and make sure everything is correct and up to date. We currently only accept businesses whose customers visit them and where we can confirm a physical presence. Businesses that may not be approved include: businesses operating from residential homes, businesses with temporary locations (including real-estate for sale) or without a physical address, mobile businesses, or businesses that have not yet opened for business. Once you’re happy that your business complies with that statement then you’re ready to move on. First step is head to this URL https://mapsconnect.apple.com/ and log in with your Apple ID and password. If you don’t already have one then you will need to create one. Click on “View My Businesses” and then the +Add button top right and you’ll see the next screen below. 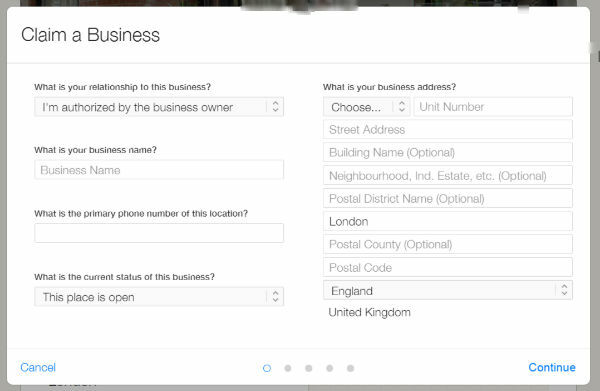 Enter your business name and location then click the search button. If your business isn’t found then you can click on the “Add New Business” link and follow the simple instructions from there. If your business is found then click on the blue “Claim This Business” button and proceed from there. This may trigger the verify by phone pop up to display but you can click on “Not Now” if you choose and come back to that in a few minutes. Complete all necessary business information, correct the location of your map marker and choose up to 3 categories. If you get stuck on these then here’s a great list you can check out (thanks Phil). Make sure your correct opening hours are showing and then add your company website along with your Twitter, Facebook and Yelp URL’s. When you’re all set you’ll get an opportunity to check all the details and then just click “Submit to Apple” which will trigger the phone verification. The call is instant and will go to the number on the listing, so be prepared! There’s a review period while the folks at Apple check and verify your data and then your listing should get updated. There are some helpful FAQ’s on the Apple Maps Connect site so if you get stuck please do refer to those. If you haven’t already looked into claiming and verifying your listing then please do make it a priority. It will take you all of 10 minutes and will help to ensure that your information on Apple Maps is correct. Then you can be confident that any potential customers will be calling the right phone number and will be able to find your location.